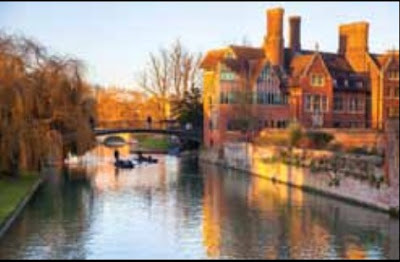 Cambridge is in eastern England and crossed by a 40-mile-long Cam River. The city that has a lot of campus buildings in the style of this beautiful old architecture offers a unique blend of traditional and modern culture. The city can be reached from London by train from Liverpool Street Station for 1.5 hours. Many of the hotels are within walking distance of the train station. In contrast to other cities in England, the train station is far away in the suburbs, but the city's atmosphere supports walking from the station to the city center. 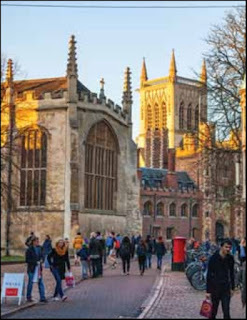 Entering the city center will be seen St John's College which was established in 1511 and became one of the most wealthy campuses after Trinity College. The campus has a Bridge of Sighs on the back of which was built in 1830 in the style of Neo Gothic. The same name is taken from the shape resemblance of the existing bridge in Venice, Italy. This bridge connects old campus buildings with new ones and according to myth, the name "Sighs" is the name for students who will face the test. Just need to pay £ 7.50, visitors can enter up to the campus backyard. Some areas are restricted for tourists, so to be able to see the Bridge of Sighs must stand in St. John's Kitchen Bridge, which is next to it. Here we can take pictures with Cam River background complete with shady and large trees along the river known as The Backs. 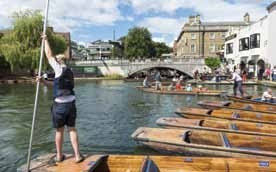 One of the activities that should not be missed while in Cambridge is the punting river cruise. 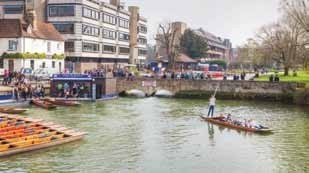 Punting is taken from the word punt, which means flat-floored boat with a capacity of about 9 people and is usually used in shallow rivers pulled by poles. Punting on the Cam River is priced at £ 14 . While waiting for our turn, we can stand on one of the bridges and gaze at the Mathematical Bridge behind Queen's College. While on the Cam River there were boats going back and forth with a bunch of ducks swimming. It was so breathtaking view! Mathematical Bridge is the first bridge punted by a punt boat that ran for 45 minutes past 8 rear of the campus building and 7 famous bridges. While rowing the boat, the guide will explain the history of all that is passed in a funny style so the trip will not be boring. 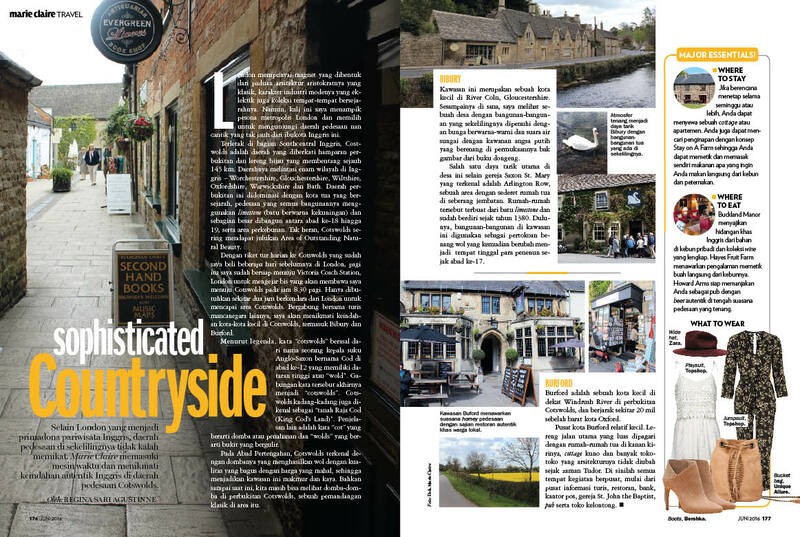 In addition to punting, joining the free walking tour is a great choice to enjoy every corner of this beautiful city. The walk-in tour that I followed started in the King's Parade area, Cambridge's most elegant street full of shops, restaurants, tourists and students. Here is also a church, the Great St. Mary's Church, belonging to one of the campuses that have existed since the 12th century. Visitors can climb to the church tower to see the beauty of Cambridge City from above. The bell in the church tower is the same shape as the bells of Big Ben London. From here, tourists are taken around for 2 hours by Cambridge University students who work part-time as a guide. The tour was delivered in an easy-to-understand language style, occasionally interspersed with humor. The tour will pass every corner of the street, buildings, and campuses scattered throughout the city. Not all campuses can be visited freely, some can only be seen from the entrance only when the exam season. Still around the King's Parade, right at the corner of the Corpus Christy College Library building, there is a very unique 1.5-meter flat, 1.5-foot round art publicwork. Artwork made of 24 carat gold moves like a clock, with a large black insect figure on its top called time eater. It is exactly the same as the street level, so it's full of tourists - including me - curious about the glass wall covering it. 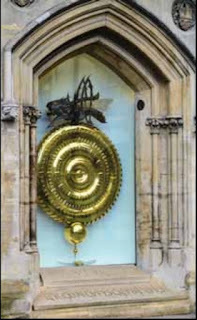 The Corpus Clock, the name of the clock, was initiated by John C. Taylor, one of Corpus Christy College Library alumni, who is also the artwork maker. This clock is accurate only once in every five minutes, the remainder of the pendulum will move or stop. According to his creators, the philosophy of this erratic movement reflects the irregularities in life, because basically time is not on the human side and will use every minute of our lives. Then we were taken to see one of the oldest buildings in this city built between the years 1000-1050 in the Anglo Saxon style, St. Benet's Church, which was originally a Christish College Parish church until 1579 and underwent restoration twice in the 19th century. We also passed one of the museums, FitzWilliam Museum, where the works of famous painters, ancient artifacts, sculptures, porcelain, furniture to medieval manuscripts and the Renaissance. Each campus in Cambridge has a spacious inner courtyard surrounded by campus buildings. There is the same interesting story from all campuses there, that all students are not allowed to step on the grass on the campus grounds. Only lecturers, janitors and ducks should step on it. It is not known exactly what the reasons behind it. The guide advised us to watch the King's Chapel's choir at King's College held every day at 17.30 so we could see the interior of the church. There is no charge to watch this choir. 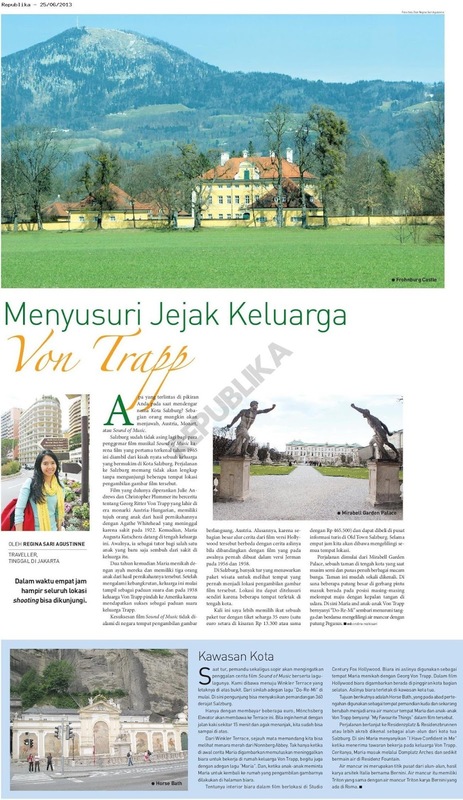 At the end of the tour, the tourists are free to tip the guide when they are satisfied, or may advise if they are not satisfied. The tour ends with a return to the King's Parade. As recommended by the guide, I was lined up to watch the choir at King's College. King's College itself is a campus founded in 1441 by Henry VI (14211471). This campus is often an icon of Cambridge, both the front of the building and the rear that looks dazzling from the River Cam and from King's Bridge. 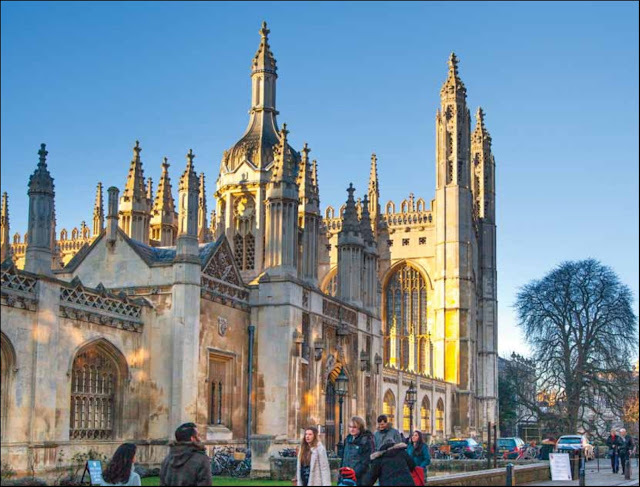 King's Chapel is a Gothic-style King's College church with stunning details of medieval stained glass design. Built in 1446 by Henry VI, this church is a place of daily worship, a place for Christmas parties and the famous Nine Lesson and Carol Festival around the world. Visitors are not allowed to take pictures inside the Church during the choir lasts for about 30 minutes. I did not expect the guided choir event to follow church mass. There is no choice but to follow the event to completion, because it is not possible to get out first, as well as to enjoy the interior details of the church. I started the day early the next day, I tried to enjoy the atmosphere of the city that has not been too crowded and take pictures in the corners of the city. Not far behind the Great St. Church Mary's, there is a traditional open market. There is nothing special about this market, just selling everyday necessities from meat, fruits, cheeses, even small cafes, but it's always interesting to see how locals do their daily activities, such as shopping. Yes, it always never quite quite how long a day is spent in this city, until the moment I have to get to the bus stop. It's hard to leave this beautiful city full of inspiration that can not be expressed in these words. From Jakarta to London, there are many airlines that offer this route, including Garuda Indonesia, Singapore Airline, KLM, Emirates, Qatar Airways, Cathay Pacific, Lufthansa, and Turkish Airline. From London Heathrow Airport to Central London take the Heathrow Express train, stop at Paddington Station. Continue up the tube to Liverpool Street Station or directly up the tube from Heathrow which is the 6th zone to Liverpool Street Station in zone 1. From Liverpool Street Station take the train to Cambridge Central Station. Can also directly ride the coach from Heathrow to Cambridge.